One of the most prominent Dutch genre painters during The Dutch Golden Age of painting, Steen was known for his humor and vivid colors. He was born in the Netherlandish town of Leyden, home of several important painters, such as Gerard Dou (1613 – 1675), Gabriel Metsu (1629 – 1667) and Rembrandt (1606 – 1669). He trained as a painter in Utrecht with the German artist, Nicolaes Knupfer (1603 – 1660) and possibly with Adriaen van Ostade (1610 – 1685). Steen was also an assistant for his father-in-law to be, Jan van Goyen (1596 – 1656), the Dutch landscape artist. His genre paintings were full of life, humor and insights into everyday life; some were famously cluttered with human untidiness. Works such as his, The Effects of Intemperance, contributed to his name being used in Dutch culture, as a “Jan Steen Household.” The artist traveled and worked throughout the Netherlands in towns such as Delft, Warmond and Haarlem, settling eventually back in Leyden. In his final years he acquired the position of president at the Guild of Saint Luke at Leyden. Steen’s style was elevated in status to his contemporaries such as Vermeer (1632 – 1675), Frans Hals (1580 – 1666) and Rembrandt (1606 – 1669). His paintings often had a moral character about them, such as his 1660 work, Love Sickness, in which he warned of quack doctors taking advantage of the incurable ailment of love’s pains. Many of Steen’s messages were subtle and approached with light humor, though his works were also simple genre depictions of life’s enjoyments. An example of the latter can be seen in his work in the Uffizi Gallery, The Luncheon. 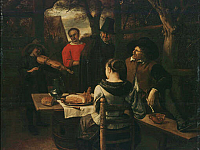 Several of his genre works were set in taverns, quite common for the Dutch Golden Age, but a unique attribute to Steen is he actually tried to run a Tavern in Delft. Thankfully he was not overly successful there and continued to become a great painter of genre works, portraits, still-life, animals, and some religious, historical and mythological subjects. His depictions of children in several works are considered to be unrivaled by contemporaries. One of his most famous portraits is of himself, titled, Self-Portrait as a Lutenist.